It must be cool to be able to light a cigarette from across the room. Then again, it's got to be a drag to think about your smouldering glances literally lighting up your lust object. Earlier this year Hanna Kite wrote in TIME Asia Magazine about a popular Japanese novel that's going on my "to read" list. Last year, a newspaper deliveryman in Japan was brought to trial for killing a seven-year-old girl. After drowning his victim, he used her cell phone to take a digital photo of the body and to send the image to her mother with a text message saying, "I've got your daughter." In a country where truth is often weirder and more gruesome than fiction, few writers can compete with the stories on the evening news. The chilling exception is Miyuki Miyabe, one of Japan's most popular authors. 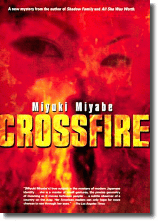 In Crossfire, her third novel to be translated into English, Miyabe's heroine, Junko, sets out on a killing spree through the suburbs of Tokyo to avenge a young couple's death. Junko has pyrokinetic powers—she incinerates her enemies by releasing a burst of energy that turns them into piles of ash. The story of Junko's quest for justice—and her ethical qualms about the bystanders killed along the way—is interwoven with the tale of the investigation by arson detective Chikako Ishizu. Miyabe doesn't hide her literary inspirations. When the investigator tells a colleague of the horrors she's seen, he responds, "This isn't a Stephen King novel. Would you lay off?" Like King, Miyabe grounds her paranormal happenings in the nitty-gritty details and constraints of the real world. Junko can light a cigarette from across the room using willpower, but she also waitresses at a local café to pay her rent.